1:1-17 What significance is to be drawn from the genealogy of Jesus here? This proves that Jesus is Messiah - King of Israel, fulfilling God's covenant with David that his kingdom would be everlasting (CP 2Sam 7:8-16, 1819, 25-29 with Psa 89:3-4, 34-37). Not all Christ's generations are listed in Matthew, but those that are will suffice for the purpose of this study. 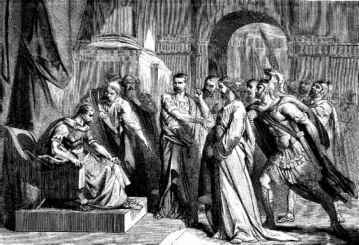 His genealogy from David is the royal line through King Solomon to Joseph, reckoned by law to be Jesus' father (CP Mt 1:16). In Luke's gospel Christ's genealogy is through another of David's sons, Nathan, to Mary, Jesus' mother (CP Lu 3:23, 31). Heli in V23 is Mary's father, Joseph's father-in-law. Joseph was his legal son, or son-in-law, and thus legally Jesus' father. It is interesting to note in Jesus' genealogy in Mt 1 that four women are mentioned in V3, 5 and 6: Tamar, Rahab, Ruth and Bathsheba ("... her that had been the wife of Uriah. ") Both Tamar and Bathsheba committed adultery (CP Gen 38; 2 Sam 11:1-5); Rahab was a harlot (CP Josh 2; Jas 2:25); only Ruth was pure (CP Ruth 3:10-11). Tamar and Bathsheba were Jews; Rahab and Ruth were Gentiles. Thus Jesus descended from both Jews and Gentiles. Of interest too is a king named Jeconias in Mt 1:11, also called Coniah, upon whom God pronounced a curse (CP Jer 22:24-30). Had Jesus been the real son of Joseph He would have come under the curse, but being Mary's son only, it could not affect Him. 1:18-21 How are we to understand this? This is more easily understood in the light of Lu 1:26-35 (CP Lu 1:26-35). This describes the virgin birth of Jesus - one of the central doctrines of the Christian faith. Many professing Christians however deny the virgin birth, and thus are denying the plain truth of scripture (CP Mt 1:22-23 with Isa 7:14). Isaiah prophesied the virgin birth in Isa 7:14 here, nearly eight hundred years before the Holy Spirit inspired Matthew to interpret the prophecy as applying to the virgin birth of Jesus, in Mt 1:22-23. All these scriptures are meaningless if there was no virgin birth. Mary was a virgin in the strictest sense. She had never had a sexual relationship with any man when Jesus was conceived in her womb. But she was not a perpetual virgin either, as so many other Christians believe (CP Mt 1:24-25). "...and knew her not till she had brought forth her first-born son", means that Joseph did consummate his marriage with Mary after the birth of Jesus. Mary had at least seven children with Joseph after Jesus was born (CP Mt 12:46-47; 13:53-56; Mk 3:20-21; 6:1-3). Friends in Mk 3:2021 (KJV), means immediate family members. This is confirmed in V31-32 (CP V31-32; Lu 8:19-20 (see also comments on Mt 12:46-47 and Mk 3:20-21)). 5:16-23, 12:41, Ac 13:33, 20:28, Php 2:5-8, Col 2:9, 1Ti 3:16, He 1:5, 5:5, 1Jn 5:6-9, Rev 1:8. 2:1 Who were the wise men and how many were there? Scriptures do not say who the wise men were, where they came from, or how many there were. All that is known of them is that they brought gifts of gold, and frankincense, and myrrh, for the baby Jesus (CP V11-12). 2:3-5 Who prophesied Christ's birthplace? The Old Testament prophet Micah prophesied that Christ would be born in Bethlehem (CP V6 with Mic 5:2). Bethlehem means "house of bread". It is not without significance that Jesus, the bread of life, was born in the house of bread (CP Jn 6:31-35). 2:13-15 What do we learn from this? We learn from this that the threat of death hung over Jesus from infancy. He was born to die, but only in God's appointed time (CP Ac 2:22-23). The prophet quoted in V15 is Hosea (CP Hos 11:1). 2:16-18 What is the meaning of this prophecy? When the wise men did not return to King Herod to report the baby Jesus' whereabouts as arranged in V7-8, Herod had all male children under two years old in Bethlehem and surrounding areas killed. He was afraid this new-born King - Jesus - would eventually take his throne (CP V1-3, 7-8, 11-13, 16). The death of these children fulfilled Jeremiah's prophecy in the Old Testament (CP Jer 31:15). Rachel was the second wife of Jacob, the mother of Joseph and Benjamin. She died giving birth to Benjamin and was buried in Ramah (CP Gen 35:1, 10, 16-19). In Jer 31:15 Rachel represents Israel weeping for the Israelites who were taken captive by Nebuchadnezzar to Babylon (CP 2Chr 36:10-20 with Jer 26:1-6). Matthew saw Rachel's weeping in Jer 31:15 as having a prophetic application to the Jewish mothers weeping over their children slain by Herod. 2:23 Where in scripture is this recorded? This was spoken by the prophets, not written. There is no record of it anywhere in scripture. 3:1 Who was John the Baptist? John the Baptist was the forerunner of Jesus, sent by God to prepare the way for the coming of Messiah (CP Isa 40:3-5; Mal 3:1 with Mt 3:3; 11:7-15; Mk 1:1-8; Lu 3:1-6; Jn 1:6-9). John was the son of Zechariah, a priest in the temple, and Elizabeth, Jesus' mother Mary's cousin (CP Lu 1:5-17, 36-44; 57). Although Jesus was John's second cousin, John did not know that Jesus was the Messiah until God told him prior to Jesus being baptized by John (CP Jn 1:29-34). John was beheaded by King Herod (CP Mt 14:1-11). See also comments on Mt 3:1-6, 3:13-15.